Rio de Janeiro (January river) Cidade Maravilhosa ( “The great city”) is one of the most beautiful cities in Brazil and it is also the capital of the state of the same name. The city has 6 094 000 inhabitants (2005) live on an area of 1 182 km ² and 11 352 003 (2005) live in the entire metropolitan area on a surface of 4 658 km ². It is noteworthy that the three municipalities previously included in the definition of the metropolitan area has recently been excluded, so that data from different sources may vary depending on whether they still expect these municipalities. Now the Brazilian government is proposing that UNESCO name the city of Rio de Janeiro a World Heritage site according to Huffington Post. The proposal was made by Iphan the agency in charge of artistic and historic apatrimony. 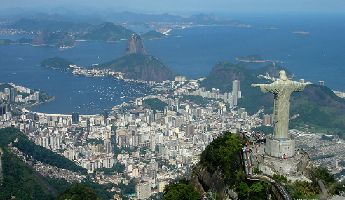 Rio de Janeiro is located on Brazil’s southeastern coast. The city is perhaps best known for its carnival. Some believe that Rio is one of the world’s most beautiful cities where high mountain wrapped in rainforest throw themselves straight into the ocean. In 2016, the Summer Olympics to be held in Rio.